There are many talented young filmmakers out there but no one impressed me with their first couple of highly ambitious and accomplished films like a 30-year old Chinese filmmaker Bi Gan did. The sheer technical prowess and visual and literal poetry of his debut film Kaili Blues in 2015 left me speechless. And ever since its debut at Cannes last year, Bi's sophomore effort, Long Day's Journey into Night had become, even before I found out that the last half of the film was shot in one continuous take in 3D, my most anticipated film of 2018. When I finally saw it at NYFF, I was in cinema heaven. Screen Anarchy: I watched the film at last year’s NYFF. It was definitely my favorite film last year. Even though I don’t want to ask you about technical questions, I can’t help being overwhelmed by its mesmerizing visuals. Obviously I am talking about the last, uncut 57 minute 3D portion of the film. What I’m wondering is, 3D technology is usually used by filmmakers to give the audience the experience close to reality. But here you are using it to the opposite effect. You are trying to emulate a dream. How did this idea come about? And what do you make of the 3D technology? 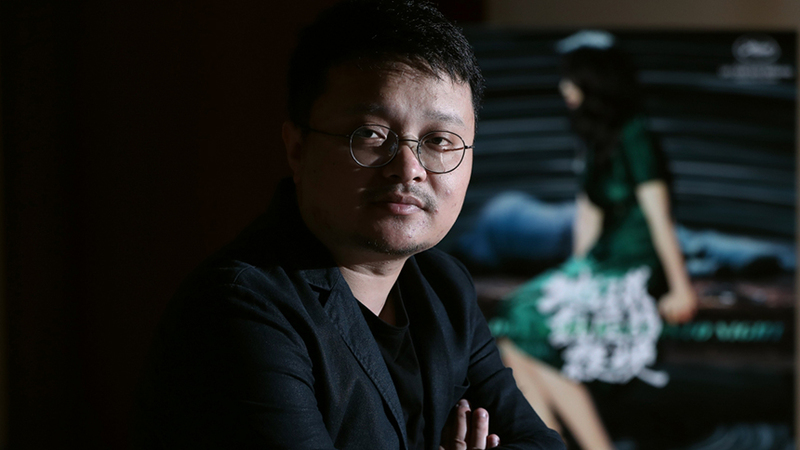 Bi Gan: My first film Kaili Blues was about time. So when I decided to make the next film, I kept going back to the ideas of dreams and memories. I thought about what would be the best way to express that. Then I thought I would find it maybe in 3D. Of course in the past, when they use that kind of technology, it’s mostly in commercial films. Art films were not utilizing 3D in that way, except for some experimental films. I wanted to combine art film and 3D to portray dreams. I thought 3D would be best suited for portraying more ‘realistic reality’ of a dream in a long take just because the whole sequence is in night time and it’s a long night. I wanted us to lose ourselves in this different dimension. So even though the film is only a hundred and twenty minutes, when we think back to it, it is very much like our memory which is three dimensional and that’s how I wanted to portray it and also have the audience experience it after the fact like a lingering memory. When I did Kaili Blues, I made it with nothing. Yet it made several millions locally at the box office. People around me were pretty surprised that the film became kind of a minor success. For general audience, they just want to know whether the film is good or not. It’s not about whether my film is an art house film. So when a film like Long Day is released, the audience doesn’t quite understand what to make of it. For a lot of them, this film is the first film they watch that is not a widely seen commercial movie. And so they still might not accept it. But at least they watched it. So that’s kind of a positive step. During the script level I was already working with the actors. I was describing what I want them to be doing. But it was a collaborative thing where I constantly asked them questions. It was the same even on set, to develop character traits and movement and stuff like that. There is a sequence where an actor is eating an apple, that was a decided on set and was a very last minute, very collaborative decision. I like the film set to be very relaxed. I want actors to be relaxed. I try to have a relaxed, collaborative environment as much as possible. So when my friends come to visit Kaili, they feel like I lied to them about what Kaili looks like. I mean, what you see on screen is a dream version loosely based on memories. But in real life Kaili is a 4th tier province in China. It’s very modern. The good news about being in there is within twenty to thirty minutes you can drive down a winding roads to beautiful rivers. The sky is very blue and beautiful. But other than that, it’s a pretty much any other modern city with all the urban comforts you can find anywhere. Yeah, I lied to you with my films. When I was setting up the film, I wanted to set up the color for characters. I thought green would be a good color to represent the female lead. And as her personality changes to something more realistic, I wanted to slowly evolve it to red. In classic mysterious female characters in films, whenever the door opens they disappear in to the background. Kaili itself is pretty green in general and so I liked the idea of her being in that green dress so she can disappear whenever into the background. Love that canto pop, "Reason to be Strong" (by Karen Mok) and that melancholic Japanese song (by Naoko Ken) at the end. How did you decide on those songs? Long Day's Journey Into Night has a limited release on April 12. Check Kino Lorber website for the city near you.